Multidimensional Amplitude Modulation - Frequency Modulation (AM-FM) representations provide non-stationary representations of image and video content. AM-FM representations capture unique image and video features that can lead to exciting applications in image and video analysis (e.g., in computer aided diagnosis). Murray, V., Rodriguez, P., and Pattichis, M.S., “ Multi-scale AM-FM Demodulation and Reconstruction Methods with Improved Accuracy,” IEEE Transactions on Image Processing, vol 19, no. 2, pp. 1138-1152, May 2010, PMID: 20071260. Refer to System and Methods of Amplitude Modulation Frequency Modulation (AM-FM) Demodulation for Image and Video Processing (U.S. Patent 8,515,201 B1) for commercialization of this technology. AM-FM features have led to several biomedical applications in computer aided diagnosis (CAD).Refer to System and Methods of Amplitude Modulation Frequency Modulation (AM-FM) Demodulation for Image and Video Processing (U.S. Patent 8,515,201 B1) for commercialization of this technology. Agurto, C., Murray, V., Yu, H., Wigdahl, J., Pattichis, M.S., Nemeth, S., Barriga, S., and Soliz, P., “ A Multiscale Optimization Approach to Detect Exudates in the Macula,” IEEE Journal of Biomedical and Health Informatics, vol. 18, no. 4, pp. 1328-1336, 2014. Loizou, C.P., Murray, V., Pattichis, M.S., Pantziaris, M., Nicolaides, A.N., and Pattichis, C.S., “ Despeckle Filtering for Multiscale Amplitude-Modulation Frequency-Modulation (AM-FM) Texture Analysis of Ultrasound Images of the Intima-Media Complex,” International Journal of Biomedical Imaging, vol. 2014 (2014), Article ID 518414, 13 pages. Agurto, C., Barriga, S., Murray, V., Nemeth, S., Crammer, R., Bauman, W., Zamora, G., Pattichis, M.S., and Soliz, P., “ Automatic Detection of Diabetic Retinopathy and Age-Related Macular Degeneration in Digital Fundus Images," Investigative Ophthalmology and Visual Science, vol. 52, no. 8, pp. 5862-5871, July 2011, PMID: 21666234. Loizou, C.P., Murray, V., Pattichis, M.S., Pantziaris, M., and Pattichis, C.S., “ Multiscale Amplitude-Modulation Frequency-Modulation (AM-FM) Analysis of Ultrasound Images of the Intima and Media Layers of the Carotid Artery,” IEEE Transactions on Information Technology in Biomedicine, vol. 15, no. 2, pp. 178-188, 2011, PMID 20889436. Loizou, C.P., Murray, V., Pattichis, M.S., Seimenis, I., Pantziaris, M., and Pattichis, C.S., “ Multiscale Amplitude-Modulation Frequency-Modulation (AM-FM) Texture Analysis of Multiple Sclerosis in Brain MRI Images,” IEEE Transactions on Information Technology in Biomedicine, vol. 15, no. 1, pp. 119-129, Jan. 2011, PMID 21062681. Christodoulou, C.I., Kaplanis, P.A., Murray, V., Pattichis, M.S., Pattichis, C.S., and Kyriakides, T., “ Multi-Scale AM-FM Analysis for the Classification of Surface Electromyographic Signals," Journal of Biomedical Signal Processing and Control, vol. 7, no. 3, pp. 265-269, 2012. Murray, V., Pattichis, M.S., Barriga, E.S., and Soliz, P., “ Recent Multiscale AM-FM Methods in Emerging Applications in Medical Imaging,” EURASIP Journal on Advances in Signal Processing (Springer), vol. 2012, no. 1, 23 pages, 2012. Non-stationary image content can be effectively analyzed by a frequency modulation process. Orthogonal AM-FM transforms can be derived as a two-step process that permutes image samples followed by the FFT. As a result, orthogonal AM-FM transforms can effectively compressed multimodal images. Pattichis, M.S. 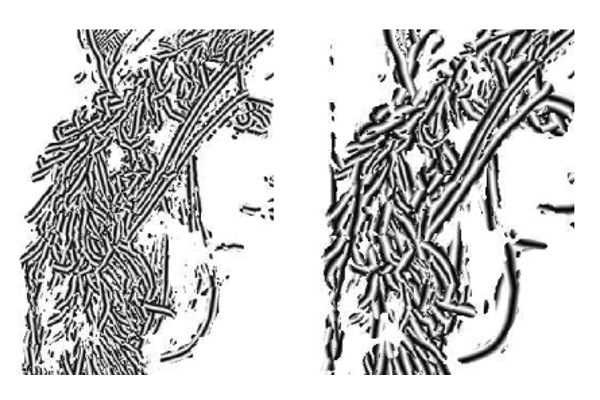 and Bovik, A.C., “Analyzing image Structure by multidimensional frequency Modulation,” IEEE Transactions on Pattern Analysis and Machine Intelligence, vol. 29, no. 5, pp. 753-766, May 2007, PMID: 17356197. Pattichis, M.S., Bovik, A.C., Havlicek, J.W., and Sidiropoulos, N.D., “Multidimensional Orthogonal FM Transforms,” IEEE Transactions on Image Processing, vol. 10, no. 3, pp. 448-464, March 2001, PMID: 18249634. Sidiropoulos, N.D., Pattichis, M.S., Bovik, A.C., and Havlicek, J.W., “COPERM: Transform-Domain Energy Compaction by Optimal Permutation,” IEEE Transactions on Signal Processing, vol. 47, no. 6, pp. 1679-1688, June 1999. AM-FM components produced ideal representations for tree rings, fingerprints, perception based video quality asssessment and compression. Ramachandran, J., Pattichis, M.S., Scuderi, L.A., and Baba, J.S., “Tree Image Growth Analysis Using Instantaneous Phase Modulation,” EURASIP Journal on Advances in Signal Processing, Special Issue: Recent Advances in Theory and Methods for Non-stationary Signal Analysis, vol. 2011, Article ID 518602, 22 pages, 2011. Lee, S., Pattichis, M.S., and Bovik, A.C., “Foveated Video Quality Assessment,” IEEE Transactions on Multimedia, vol. 4, no. 1, pp. 129-132, March 2002. Lee, S., Pattichis, M.S., and Bovik, A.C., “Foveated Video Compression with Optimal Rate Control,” IEEE Transactions on Image Processing, vol. 10, no. 7, pp. 977-992, July 2001, PMID: 18249671. Pattichis, M.S., Panayi, G., Bovik, A.C., and Shun-Pin, H., “Fingerprint Classification Using an AM-FM Model,” IEEE Transactions on Image Processing, vol. 10, no. 6, pp. 951-954, June 2001.